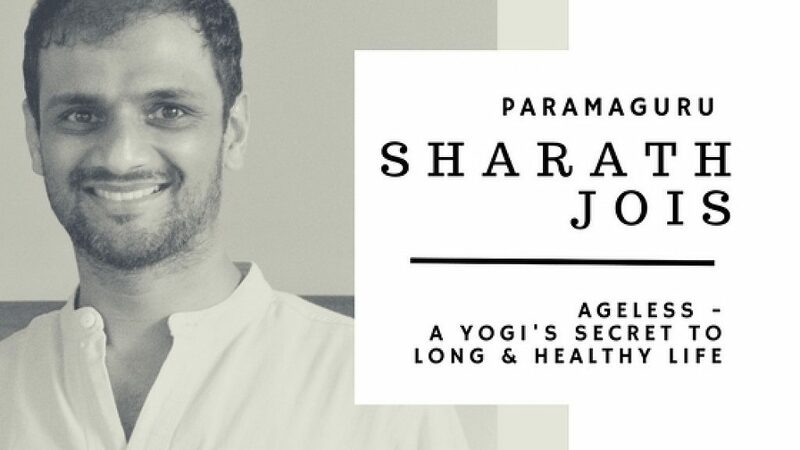 The current lineage holder of Ashtanga Yoga, Sh. 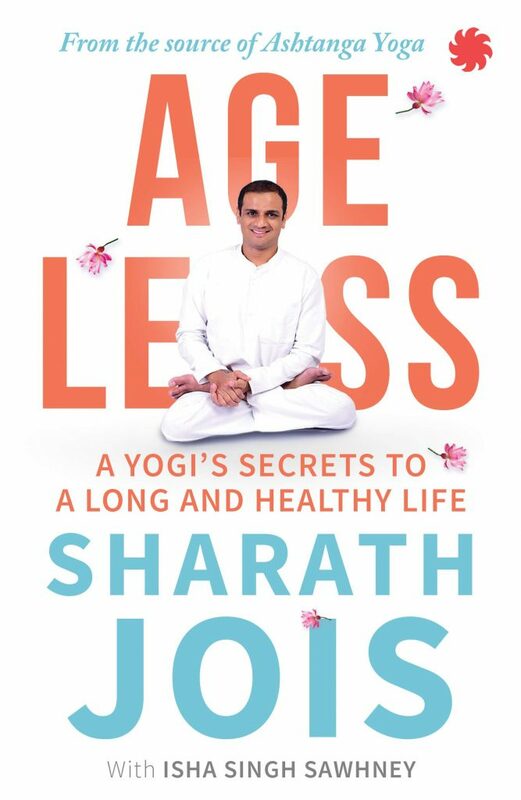 Sharath Jois, has written a a new book called Ageless – A Yogi’s Secret to Long and Healthy Life. The book has been written in association with author Isha Singh Sawhney. The book is an easy read and has great ideas on how to introduce Yoga in your life to live a healthy and fulfilling life. It delves into the ancient secrets that will be helpful to any person, who is looking to make a journey of knowing the SELF. Touching upon the most important aspects of our day to day life, it is a gem that provides us details about how to manage our physical, spiritual and mental body. What I enjoyed most about this book was how simple the recommendations were and how easy it is to follow them. The book uses the eight limbs of Ashtanga Yoga – Yama, Niyama, Asana, Pranayama, Pratyahara, Dharana, Dhyana and Samadhi to introduce the concepts of managing the body and mind. From a physical stand point the book recommends that one should eat less to stay healthy and practice a set of 10 recommended Asanas. Both these techniques are accessible to anyone and everyone. From a spiritual stand point – Sharath introduces a quote from his grandfather, Sh. Pattabhi Jois – where by looking inwards rather than outwards will help to stay positive and manage challenges of our day to day life. Touching on the breath – the prana – the third limb of Ashtanga Yoga – a few recommendations like breathing slowly, observing the breath etc. will help anyone be more calm and help reduce stress. As humans we can reduce stress, anxiety and depression by being part of a community. This is a theme that I didn’t expect as part of this book, but was happy to see it included. Looking back at my own experiences in Mysore, while practicing at KPJAYI, being part of a global community was one of the most treasured part of my stay in Mysore. It has helped shape many parts of who I am, as an individual. The community concept was introduced through some very relevant and researched examples. Helping self and helping others will help one lead a more fulfilling life. Most of us are aware of this fact but easily ignore it. Reading it reinforced some of my own beliefs as we learn to live a life as Yogi’s in today’s world. All in all, I enjoyed reading about food, asanas, breath, community and mind management. I may be aware of many things unconsciously through my own experiences but may not have necessarily been aware of them. This book has helped me learn about those things. This book will appeal to you, if you are looking to live a healthier life, have yearning to understand how adopt a Yogic lifestyle by learning the basic principles of Yoga. You may be a householder, student or an executive, some part of the book will surely grab your attention. In today’s fast paced world, this book is a breath of fresh air. It is a great introduction to Yogic concepts that connects science to spirituality to our modern day living. Sharath is a great example as he is living such a life and has put forth these principles to be shared with others. The writer of book Isha captures the true essence of the Yogic principles as described by Sharath Jois. The book has been published by Juggernaut Books. You can buy the book from Amazon India by clicking here. ← Episode 10: The Principalled Lady: Latha D.